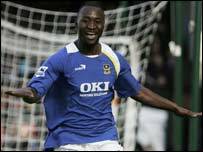 Portsmouth striker Lomana LuaLua has admitted that he is still not fit enough to play in the Premiership. The 25-year-old is still feeling the effects of an ankle injury he picked up against Arsenal last season and that he aggravated in a pre-season friendly. LuaLua made his first league start since April in Pompey's 2-1 defeat away at Tottenham on Sunday. He said: "It was my first real game, and on reflection I'm not as fit as I could be. I'm lacking sharpness." LuaLua is currently in Tripoli for DR Congo's 2008 African Cup of Nations qualifier against Libya and is hoping he can improve his fitness on international duty. "I have a game for DR Congo now and I need to play for my fitness. I need to play - and they need me," LuauLua added. "I know I have to fight for my place at Portsmouth, and so I want to get back to the right level quickly. "I wasn't happy with how I played against Spurs. It was disappointing. "I just wanted to play. But on balance, it might have been better waiting. When I was injured I was trying to get over the ankle problem. I wasn't concentrating on my running and fitness so much. "I would like a run in the team, but to do that I need my sharpness. "I would be happy with just some kind of run-out against West Ham - but to be honest, I would understand it if I didn't start."